In the final decade of his life, Luther became even more bitter in his attitude towards the papists. He was denied another public hearing such as those at Worms and Speyer, and he managed to avoid the martyrdom which came to other reformers, whether at the stake or, in the case of Zwingli, in battle (at Kappel in 1531). He compensated by hurling vitriol at the papacy and the Roman Curia. Towards the end of his life, he issued an illustrated tract with outrageously vulgar cartoons. In all of this, he was utterly unrestrained. The Holy Roman Empire was a constitutional monarchy, and the emperor had sworn at his coronation that no German subject should be outlawed unheard and uncondemned. Although this clause had not yet invoked to protect a monk accused of heresy, yet when princes and electors came to be involved the case was altered. If Charles V were faithless to that oath, then he might be resisted even in arms by the lower magistrates. The formula thus suggested by the jurists to Luther was destined to have a very wide an extended vogue. The Lutherans employed it only until they gained legal recognition at Augsburg in 1555. Thereafter the Calvinists took up the slogan and equated the lower magistrates with the lesser nobility in France. Later historians were accustomed to regard Lutheranism as politically subservient and Calvinism as intransigent, but the origin of this doctrine was in the Lutheran soil. Martin Luther was made for the ministry. During his last years, he continued to attend faithfully to all the obligations of the university and his parish. To the end he was preaching, lecturing, counselling and writing. At the end of his life, he was in such a panic of disgust because the young women at Wittenberg were wearing low necks that he left home declaring that he would not return. His physician brought him back, but then came a request from the counts of Mansfeld for a mediator in a dispute. Melanchthon was too sick to go, and though Luther was also very ill, he went, reconciled the counts and died on the way home. His later years should not, however, be written off as the splutterings of a dying flame. If in his polemical tracts he was at times savage and course, in the works which really counted in the cannon of his life’s endeavour he grew constantly in maturity and artistic creativity. Improvements in the translation of the Bible continued to the very end. The sermons and biblical commentaries reached superb heights. Many of the passages quoted to illustrate Luther’s religious and ethical principles are also from this later period. Economics went the way of capitalism and politics the way of absolutism, but the home took on that quality of affectionate and godly patriarchalism which Luther had set as the pattern of his own household. Luther’s most profound impact was in their religion, of course. His sermons were read to the congregations, his liturgy was sung, his catechism was rehearsed by the father of the household, his Bible cheered the faint-hearted and consoled the dying. By contrast, no single Englishman had the range of Luther. The Bible translation was largely the work of Tyndale, the prayer-book was that of Cranmer, the Catechism of the Westminster Divines. The style of sermons followed Latimer’s example and the hymn book was owed much to George Herbert from the beginning. Luther, therefore, did the work of five Englishmen, and for the sheer richness and exuberance of vocabulary and mastery of style, his use of German can only be compared with Shakespeare’s use of English. In the second great area of influence, that of the Church, Luther’s influence extended far beyond his native land, as is shown below. In addition to his influence in Germany, Switzerland, Hungary and England, Lutheranism took possession of virtually the whole of Scandinavia. His movement gave the impetus that sometimes launched and sometimes gently encouraged the establishment of other varieties of Protestantism. Catholicism also owes much to him. It is often said that had Luther not appeared, an Erasmian reform would have triumphed, or at any rate a reform after the Spanish model. All this is, of course, conjectural, but it is obvious that the Catholic Church received a tremendous shock from the Lutheran Reformation and a terrific urge to reform after its own pattern. The movement initiated by Luther soon spread throughout Germany. Luther provided its chief source of energy and vision until his death in 1546. Once Luther had passed from the scene, a period of bitter theological warfare occurred within Protestantism. There was controversy over such matters as the difference between ‘justification’ and ‘sanctification’; what doctrine was essential or non-essential; faith and works; and the nature of the real presence at the Eucharist. This is the period when Lutheranism developed, something which Luther himself predicted and condemned. The Schmalkald Articles had been drawn up in 1537 as a statement of faith. The Protestant princes had formed the Schmalkald League as a kind of defensive alliance against the Emperor. The tragic Schmalkald War broke out in 1547 in which the Emperor defeated the Protestant forces and imprisoned their leaders. But the Protestant Maurice of Saxony fought back successfully and by the Treaty of Passau (1552), Protestantism was legally recognised. This settlement was confirmed by the Interim of 1555. It was during this period that some of the Lutheran theologians drove large numbers of their own people over to the Calvinists through their dogmatism. God subdued and brought my heart to docility. It was more hardened against such matters than was to be expected in such a young man. After that, he wrote little about his inner life, content to trace God’s hand controlling him. He next broke with Roman Catholicism, leaving France to live as an exile in Basle. It was there that he began to formulate his theology, and in 1536 published the first edition of The Institutes. It was a brief, clear defence of Reformation beliefs. Guillaume Farel, the Reformer of Geneva, persuaded Calvin to help consolidate the Reformation there. He had inherited from his father an immovable will, which stood him in good stead in turbulent Geneva. In 1537 all the townspeople were called upon to swear loyalty to a Protestant statement of belief. But the Genevans opposed Calvin strongly, and disputes in the town, together with a quarrel with the city of Berne, resulted in the expulsion of both Calvin and Farel. Calvin went to Strasbourg, where he made contact with Martin Bucer, who influenced him greatly. Bucer (1491-1551) had been a Dominican friar but had left the order and married a former nun in 1522. He went to Strasbourg in 1523 and took over leadership of the reform, becoming one of the chief statesmen among the Reformers. He was present at most of the important conferences, or colloquies of the Reformers, and tried to mediate between Zwingli and Luther in an attempt to unite the German and Swiss Reformed churches. His discussions with Melanchthon led to peace in the debate over the sacraments at the Concord of Wittenberg. He also took part in the unsuccessful conferences with the Roman Catholics at Hagenau, Worms and Ratisbon. In 1539, while in Strasbourg, Calvin published his commentary on the Book of Romans. Many other commentaries followed, in addition to a new, enlarged version of the Institutes. The French Reformer led the congregation of French Protestant refugees in Strasbourg, an experience which matured him for his task on returning to Geneva. He was invited back there in September 1541, and the town council accepted his revision of the of the city laws, but many more bitter disputes followed. Calvin tried to bring every citizen under the moral discipline of the church. Many naturally resented such restrictions, especially when imposed by a foreigner. He then set about attaining of establishing a mature church by preaching daily to the people. He also devoted much energy to settling differences within Protestantism. The Consensus Tigurinus, on the Lord’s Supper (1549), resulted in the German-speaking and French-speaking churches of Switzerland moving closer together. Michael Servetus, a notorious critic of Calvin, and of the doctrine of the Trinity, was arrested and burnt in Geneva. John Calvin, caricatured by one of his students, during an idle moment in a lecture. We declare that by God’s providence, not only heaven and earth and inanimate creatures, but also the counsels and wills of men are governed so as to move precisely to that end destined by him. Lutheranism strongly influenced Calvin’s doctrine. Like Luther, Calvin was also a careful interpreter of the Bible. He intended that his theology should interpret Scripture faithfully, rather than developing his own ideas. For him, all knowledge of God and man is to be found only in the Word of God. Man can only know God if he chooses to make himself known. Pardon and salvation are possible only through the free working of the grace of God. Calvin claimed that even before the creation, God chose some of his creatures for salvation and others for destruction. He is often known best for this severe doctrine of election, particularly that some people are predestined to eternal damnation. But Calvin also set out the way of repentance, faith and sanctification for believers. In his doctrine, the church was supreme and should not be restricted in any way by the state. He gave greater importance than Luther to the external organisation of the church. He regarded only baptism and communion as sacraments. Baptism was the individual’s initiation into the new community of Christ. He rejected Zwingli’s view that the communion elements were purely symbolic, but also warned against a magical belief in the real presence of Christ in the sacrament. The Calvinists went further than the Lutherans in their opposition to traditions which had been handed down. They rejected a good deal of church music, art, architecture and many more superficial matters such as the use of the ring in marriage, and the signs of devotional practice. But all the Reformers rejected the authority of the pope, the merit of good works, indulgences, the mediation of the Virgin Mary and the saints, and all the sacraments which had not been instituted by Christ. They rejected the doctrine of transubstantiation (the teaching that the bread and wine of the communion became the body and blood of Christ when the priest consecrated them), the view of the mass as a sacrifice, purgatory and prayers for the dead, private confession of sin to a priest, celibacy of the clergy, and the use of Latin in the services.They also rejected all the paraphernalia that expressed these ideas, such as holy water, shrines, chantries, images, rosaries, paternoster stones and candles. Meanwhile, in 1549 Bucer was forced to leave Strasbourg for Cambridge, and while in England, he advised Cranmer on The Book of Common Prayer. He had a great impact on the establishment of the Church of England, pointing it in the direction of Puritanism. Although he died in 1551, his body was exhumed and burned during the Catholic reaction under Queen Mary. Bucer wrote a large number of commentaries on the Bible and worked strenuously for reconciliation between various religious parties. In France, the pattern of reform was very different. Whereas in Germany and Switzerland there was solid support for the Reformation from the people, in France people, court and church provided less support. As a result, the first Protestants suffered death or exile. But once the Reformed faith had been established in French-speaking Switzerland and in Strasbourg, Calvinists formed a congregation in Paris in 1555. Four years later, over seventy churches were represented at a national synod in the capital. Henry VIII may have destroyed the power of the papacy and ended monasticism in England, but he remained firmly Catholic in doctrine. England was no safe place for William Tyndale to translate the Bible into English, as Henry and the bishops were more concerned to prevent the spread of Lutheran ideas than to promote the study of Scripture. Tyndale narrowly escaped arrest in Cologne but managed to have the New Testament published in Worms in 1525. He was unable to complete the Old Testament because he was betrayed and arrested near Brussels in 1535. In October 1536 he was strangled and burnt at the stake. His last words were reported as, Lord, open the king of England’s eyes. In the meantime, Miles Coverdale completed the translation, which became the basis for later official translations. The title page of the first Bible to be printed in English: Miles Coverdale’s translation (1535). Coverdale had helped Tyndale to revise his translation of the Pentateuch. Though the king’s eyes were not immediately opened, a powerful religious movement towards reform among his people was going on at the same time. Despite the publication of the Great Bible in 1538, it was only under Edward VI (1547-53) that the Reformation was positively and effectively established in England. The leading figure was the Archbishop of Canterbury, Thomas Cranmer, supported by the scholar, Nicholas Ridley and the preacher, Hugh Latimer. 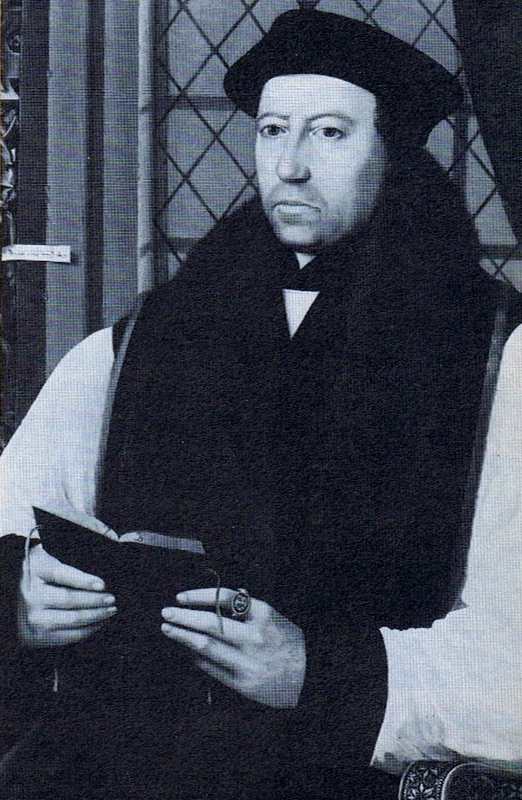 Cranmer (1489-1556) was largely responsible for the shaping the Protestant Church of England. Born in Nottinghamshire, he was educated at Cambridge until he was suddenly summoned to Canterbury as Archbishop in 1532, as a result of Henry VIII’s divorce crisis. There he remained until he was deposed by Mary and burnt as a heretic at Oxford in 1556. He was a godly man, Lutheran in his theology, well read in the Church Fathers, a gifted liturgist with an excellent command of English. He was sensitive, cautious and slow to decide in a period of turbulence and treachery. He preferred reformation by gentle persuasion rather than by force, and, unlike Luther, also sought reconciliation with Roman Catholicism. Like Luther, however, he believed firmly in the role of the ‘godly prince’ who had a God-given task to uphold a just society and give free scope to the gospel. Archbishop Cranmer (pictured above) was responsible for the Great Bible (1538) and its prefaces; the Litany (1545) and the two Prayer Books (1549, 1552). The driving force of Cranmer’s life was to restore to the Catholic Church of the West the faith it had lost long ago. When the Church of Rome refused to reform, Cranmer took it upon himself to reform his own province of Canterbury. He then sought an ecumenical council with the Lutherans and Calvinists, but Melanchthon was too timid. His second great concern was to restore a living theology based on the experience of the person and work of Christ. Thirdly, he developed the doctrine of the Holy Spirit which lay behind his high view of scripture and tradition, and the meaning of union with Christ. He was brainwashed into recanting, but at his final trial in 1556 he put up a magnificent defence and died bravely at the stake, thrusting the hand that had signed the recantations into the fire first. The Martyrs’ Memorial at Oxford commemorates his death, together with those of Ridley and Latimer whose deaths he had witnessed from prison a year earlier. Several European Reformers also contributed to the Anglican Reformation, notably Martin , exiled from Strasbourg. These men, Calvinists rather than Lutherans, Bucerbecame professors at the universities of Oxford and Cambridge. Under the Counter-Reforming Catholic Queen Mary (1553-58), with Cardinal Pole as Archbishop of Canterbury, about two hundred bishops, scholars, ministers and preachers were burnt at the stake. Many Protestant reformers fled to the continent and became even more Calvinist in their convictions, influencing the direction of the English Reformation when they returned at the beginning of Elizabeth I’s reign. The young Queen gradually replaced the Catholic church leaders with Protestants, restored the church Articles and Cranmer’s Prayer Book. She took the title of Supreme Governor of the Church of England. Her Anglican church kept episcopal government and a liturgy which offended many of the strict Protestants, particularly those who were returning religious refugees who had been further radicalised in Calvinist Switzerland or France. Scotland was first awakened to Lutheranism by Patrick Hamilton, a student of Luther, who had been burned for his faith in 1528. George Wishart and John Knox (1505-72) continued Hamilton’s work, but Knox was taken prisoner by the French in 1547 and forced to serve as a galley-slave. When freed, he studied under Calvin at Geneva and did not return to Scotland until 1559, when he fearlessly launched the Reformation. He attacked the papacy, the mass and Catholic idolatry. The Catholic Mary Queen of Scots opposed Knox, but was beaten in battle. Knox then consolidated the Scots reformation by drawing up a Confession of Faith (1560), a Book of Discipline (1561) and the Book of Common Order (1564). While the Scottish Reformation was achieved independently from England, it was a great tragedy that it was imposed on Ireland, albeit through an Act of Uniformity passed by the Irish Parliament in 1560 which set up Anglicanism as the national religion. In this way, Protestantism became inseparably linked with English rule of a country which remained predominantly Catholic. Western Europe during the Wars of Religion, to 1572. In Hungary, students of Luther and Melanchthon at Wittenberg took the message of the Reformation back to their homeland in about 1524, though there were Lollard and Hussite connections, going back to 1466, which I’ve written about in previous posts. As in Bohemia, Calvinism took hold later, but the two churches grew up in parallel. The first Lutheran synod was in 1545, followed by the first Calvinist synod in 1557. In the second half of the sixteenth century, a definite interest in Protestant England was already noticeable in Hungary. In contemporary Hungarian literature, there is a long poem describing the martyr’s death of Thomas Cranmer (Sztáray, 1582). A few years before this poem was written, in 1571, Matthew Skaritza, the first Hungarian Protestant theologian made his appearance in England, on a pilgrimage to ‘its renowned cities’ induced by the common religious interest. Protestant ministers were recruited from godly and learned men. The Church of England and large parts of the Lutheran church, particularly in Sweden, tried to keep the outward structure and ministry of their national, territorial churches. Two brothers, Olav and Lars Petri, both disciples of Luther, inaugurated the Reformation in Sweden. The courageous King Gustavus Vasa, who delivered Sweden from the Danes in 1523, greatly favoured Protestantism. The whole country became Lutheran, with bishops of the old church incorporated into the new, and in 1527 the Reformation was established by Swedish law. This national, state church was attacked by both conservative Catholics and radical Protestants. The Danish Church, too, went over completely to Protestantism. Some Danes, including Hans Tausen and Jörgen Sadolin, studied under Luther at Wittenberg. King Frederick I pressed strongly for church reform, particularly by appointing reforming bishops and preachers. As a result, there was an alarming defection of Catholics and in some churches no preaching at all, and a service only three times a year. After this, King Christian III stripped the bishops of their lands and property at the Diet of Copenhagen (1536) and transferred the church’s wealth to the state. Christian III then turned for help to Luther, who sent Bugenhagen, the only Wittenberger theologian who could speak the dialects of Denmark. Bugenhagen crowned the king and appointed seven superintendents. This severed the old line of bishops and established a new line of presbyters. At the synods which followed church ordinances were published, and the Reformation recognised in Danish law. The decayed University of Copenhagen was enlarged and revitalised. A new liturgy was drawn up, a Danish Bible was completed, and a modified version of the Augsburg Confession was eventually adopted. The Reformation spread from Denmark to Norway in 1536. The pattern was similar to that of Denmark. Most of the bishops fled and, as the older clergy died, they were replaced with Reformed ministers. A war between Denmark and Norway worsened social and political conditions. When the Danish Lutherans went to instruct the Norwegians, they found that many of the Norwegians spoke the incomprehensible old Norse, and communications broke down. In Iceland, an attempt to impose the Danish ecclesiastical system caused a revolt. This was eventually quelled and the Reformation was imposed, but with a New Testament published in 1540. Calvinists held an exalted and biblical view of the church as the chosen people of God, separated from the state and wider society. They, therefore, broke away from the traditional church structures as well as the Roman ministry. The spread of Calvinism through key sections of the French nobility, and through the merchant classes in towns such as La Rochelle alarmed Catherine de Medici, the French Regent, resulting eventually in the St Bartholomew’s Day Massacre of 1572. Philip II faced a similarly strong Calvinist challenge in the United Provinces of the Netherlands. In 1565, an outbreak of anti-Catholic rioting could not be contained because all the available forces were deployed in the Mediterranean to defend southern Italy from the Turks and to lift the siege of Malta. The spread of Calvinism was a coral growth in ports and free cities, compared with the territorial growth of Lutheranism which was dependent on earthly principalities and powers. In this, the free churches later followed them. These churches were mainly fresh expressions of Calvinism which started to grow at the beginning of the next century, but some did have links to, or were influenced by, the churches founded in the aftermath of the Radical Reformation. Only three groups of Anabaptists were able to survive beyond the mid-sixteenth century as ordered communities: the ‘brethren’ in Switzerland and southern Germany, the Hutterites in Moravia and the Mennonites in the Netherlands and northern Germany. In the aftermath of the suppression of Münster, the dispirited Anabaptists of the Lower-Rhine area were given new heart by the ministry of Menno Simons (about 1496-1561). The former priest travelled widely, although always in great personal danger. He visited the scattered Anabaptist groups of northern Europe and inspired them with his night-time preaching. Menno was an unswerving, committed pacifist. As a result, his name in time came to stand for the movement’s repudiation of violence. Although Menno was not the founder of the movement, most of the descendants of the Anabaptists are still called ‘Mennonites’. The extent to which the early Baptists in England were influenced by the thinking of the Radical Reformation in Europe is still hotly disputed, but it is clear that there were links with the Dutch Mennonites in the very earliest days. If I were a Jew, I would suffer the rack ten times before I would go over to the pope. The papists have so demeaned themselves that a good Christian would rather be a Jew than one of them, and a Jew would rather be a sow than a Christian. What good can we do the Jews when we constrain them, malign them, and hate them as dogs? When we deny them work and force them to usury, how can that help? We should use towards the Jews not the pope’s but Christ’s law of love. If some are stiff-necked, what does that matter? We are not all good Christians. Luther was sanguine that his own reforms, by eliminating the abuses of the papacy, would accomplish the conversion of the Jews. But the coverts were few and unstable. When he endeavoured to proselytise some rabbis, they undertook in return to make a Jew out of him. The rumour that a Jew had been authorised by the papists to murder him was not received with complete incredulity. In his latter days, when he was more easily irritated, news came that in Moravia, Christians were being induced to become Judaic in beliefs and practice. That was what induced him to come out with his rather vulgar blast in which he recommended that all Jews be deported to Palestine. Failing that, he wrote, they should be forbidden to practice usury, should be compelled to earn their living on the land, their synagogues should be burned, and their books, including The Torah, should be taken away from them. The content of this tract was certainly far more intolerant than his earlier comments, yet we need to be clear about what he was recommending and why. His position was entirely religious and not racially motivated. The supreme sin for him was the persistent rejection of God’s revelation of himself in Jesus Christ. The centuries of persecution suffered by the Jews were in themselves a mark of divine displeasure. The territorial principle should, therefore, be applied to the Jews. They should be compelled to leave and go to a land of their own. This was a programme of enforced Zionism. But, if this were not feasible, Luther would recommend that the Jews be compelled to live from the soil. He was, perhaps unwittingly, proposing a return to the situation which had existed in the early Middle Ages, when the Jews had worked in agriculture. Forced off the land, they had gone into commerce and, having been expelled from commerce, into money-lending. Luther wished to reverse this process and to accord the Jews a more secure, though just as segregated position than the one they had in his day, following centuries of persecutions and expulsions. His advocacy of burning synagogues and the confiscation of holy books was, however, a revival of the worst features of the programme of a fanatical Jewish convert to Christianity, Pfefferkorn by name, who had sought to have all Hebrew books in Germany and the Holy Roman Empire destroyed. In this conflict of the early years of the Reformation, Luther had supported the Humanists, including Reuchlin, the great German Hebraist and Melanchthon’s great-uncle. Of course, during the Reformation throughout Europe, there was little mention of the Jews except in those German territories, like Luther’s Saxony, Frankfurt and Worms, where they were tolerated and had not been expelled as they had been from the whole of England, France and Spain. Ironically, Luther himself was very Hebraic in his thinking, appealing to the wrath of Jehovah against any who would impugn his picture of a vengeful, Old Testament God. On the other hand, both Luther and Erasmus were antagonistic towards the way in which the Church of their day had relapsed into the kind of Judaic legalism castigated by the Apostle Paul. Christianity, said Erasmus, was not about abstaining from butter and cheese during Lent, but about loving one’s neighbour. This may help to explain Luther’s reaction to the Moravian ‘heresy’ in terms which, nevertheless, only be described as anti-Semitic, even by the standards of his time. The story told in Cohn’s great book Pursuit of the Millennium, originally written six decades ago, is a story which began more than five centuries ago and ended four and a half centuries ago. However, it is a book and a story not without relevance to our own times. In another work, Warrant for Genocide: the myth of the Jewish World Conspiracy and the Protocols of the Elders of Zion, published in 1967, Cohn shows how closely the Nazi fantasy of a world-wide Jewish conspiracy of destruction is related to the fantasies that inspired millenarian revolutionaries from the Master of Hungary to Thomas Müntzer. The narrative is one of how mass disorientation and insecurity have fostered the demonisation of the misbelievers, especially the Jews, in this as much as in previous centuries. We can also reflect on the damage wrought in the twentieth century by left-wing revolutions and revolutionary movements, which are just as capable of demonising religious and ethnic groups, including Jews, through their love of conspiracy theories and narratives. What is most curious about the popular Müntzer ‘biopic’, for example, is the resurrection and apotheosis which it has undergone during the past hundred and fifty years. From Engels through to the post-Marxist historians of this century, whether Russian, German or English-speaking, Müntzer has been conflated into a giant symbol, a prodigious hero in the history of ‘class warfare’. This is a naive view and one which non-Marxist historians have been able to contradict easily by pointing to the essentially mystical nature of Müntzer’s preoccupations which usually blinded him to the material sufferings of the poor artisans and peasants. He was essentially a propheta obsessed by eschatological fantasies which he attempted to turn into reality by exploiting social discontent and dislocation through revolutionary violence against the misbelievers. Perhaps it was this obsessive tendency which led Marxist theorists to claim him as one of their own. Just like the medieval artisans integrated in their guilds, industrial workers in technologically advanced societies have shown themselves very eager to improve their own conditions; their aim has been the eminently practical one of achieving a larger share of economic security, prosperity and social privilege through winning political power. Emotionally charged fantasies of a final, apocalyptic struggle leading to an egalitarian Millennium have been far less attractive to them. Those who are fascinated by such ideas are, on the one hand, the peoples of overpopulated and desperately poor societies, dislocated and disoriented, and, on the other hand, certain politically marginalised echelons in advanced societies, typically young or unemployed workers led by a small minority of intellectuals. Working people in economically advanced parts of the world, especially in modern Europe, have been able to improve their lot out of all recognition, through the agency of trade unions, co-operatives and parliamentary parties. Nevertheless, during the century since 1917 there has been a constant repetition, on an ever-increasing scale, of the socio-psychological process which once connected the Táborite priests or Thomas Müntzer with the most disoriented and desperate among the poor, in fantasies of a final, exterminating struggle against ‘the great ones’; and of a perfect, egalitarian world from which self-seeking would be forever banished. We are currently engaged in yet another cycle in this process, with a number of fresh ‘messiahs’ ready to assume the mantles of previous generations of charismatic revolutionaries, being elevated to the status of personality cults. Of course, the old religious idiom has been replaced by a secular one, and this tends to obscure what would otherwise be obvious. For it is a simple truth that stripped of its original supernatural mythology, revolutionary millenarianism is still with us. John H. Y. Briggs (1977), The History of Christianity. Berkhamsted: Lion Publishing. Sándor Fest (2000), Skóciai Szent Margittól, A Walesi Bárdokig: Magyar-Angol történeti és irodalmi kapcsalatok. Norman Cohn (1970), The Pursuit of the Millennium: Revolutionary Millenarians and Mystical Anarchists of the Middle Ages. St Albans: Granada Publishing. Roland H. Bainton (1950), Here I Stand: A Life of Martin Luther. Nashville, USA: Abingdon Press. András Bereznay (1994, 2001), The Times Atlas of European History. London: HarperCollins. Above: pages from Spot the Style: A Mini Guide to architecture in Britain, by David Pearce. London: P Murray. Below: Seckford Street in Woodbridge, Suffolk, named after the Tudor lawyer, parliamentarian and benefactor. In 1587 he decided to donate a large measure of his wealth to endowing ‘certain almshouses’ in the town. He died the same year, and his tomb can be seen in St.Mary’s Parish Church. As Anglicanism became established, parish churches continued to hear the celebration of the eucharist (holy communion) in the form set out in Cranmer’s Book of Common Prayer and readings from the translations of the Bible later consolidated in the Authorised Version of 1612. The repetition of prayers and readings, noble in expression, brought linguistic unity to England. The adoption by the Scottish Kirk of English translations of the Bible may have thwarted the separate development of Lallans (lowland Scots) and a different cultural tradition, which made the transition to the unity of the kingdoms much easier. Those devising the new services had a long tradition of devotional literature to draw on. Tyndale and Cranmer had a language ready for expression and translation of the complex Judaeo-Christian tradition in new forms. This was due to the creation of English as a language of intellect and the higher emotions by authors of vernacular works by poets and writers who drew their themes and inspirations from shrines, pilgrimages, visions and the telling of legends of saints and Arthurian heroes. Some of those writers were women, such as the turbulent visionary Margery Kempe, who wrote the first autobiography in English, and the gentle, reclusive Julian of Norwich. The poets and writers included, most notably, Geoffrey Chaucer, who set his greatest poem in the framework of a pilgrimage to Canterbury. William Langland’s Piers Ploughman arose from a vision on the Malvern Hills. Thomas Malory gave new life to the common British tradition in his Morte D’Arthur. The holy place that most fully commemorates the English literary tradition is Poets’ Corner in Westminster Abbey, where the names of those buried among kings and knights make it a resting place of genius unrivalled in Europe. The only name missing is that of England’s national bard, William Shakespeare, but it is perhaps appropriate that he lies by the altar of his parish church, Holy Trinity in Stratford-upon-Avon, where he was also baptised and grew up listening to the language of Cranmer’s English Bible and Prayer Book. Looking back on the achievements of Elizabeth’s reign, historians have referred to it as an age, one in which England survived national and international crises to be recognised as a centre of artistic splendour. During her reign and that of James I, a total period of seventy years, or one full lifespan, the English language achieved a richness and vitality of expression that even contemporaries marvelled at. However, contemporaries at the beginning of this period had recognised that their native tongue was barely ready, after centuries of Latin and French dominance, for serious literary and scholarly purposes. England, not even yet united with the Tudor homeland of Wales, was a small nation, just beginning to flex its international muscles. Its statesmen tended to indulge in hyperbole, like the poet, courtier and soldier, Sir Philip Sidney, who claimed that English hath it equally with any other tongue in the world. It was the confluence of three historical developments, at least two of which were common to much of Europe, and occurred earlier in many countries, the Renaissance and the Reformation, which really propelled England forward during these years. The third, most dynamic factor, was its emergence as the leading maritime power. The Renaissance had different effects in each European country. In England it had coincided with a communications revolution following Caxton’s setting up of his printing press at Westminster. This revolution has only recently been surpassed by the present age of computer and internet technology. The printing press transformed society. Before 1500 there were only about thirty-five thousand printed books in Europe as a whole, mostly in Latin. Between 1500 and 1640, some twenty thousand items were printed in English alone, ranging from pamphlets and broadsheets to folios and Bibles. The result was to accelerate the education of the middling sort and even some of the lower orders of society, so that by 1600, it has been estimated, as much as half the population had some kind of minimal literacy, and a much higher proportion in the cities and towns. In a growing free market in the printed word, the demand for books in English outstripped the demand for the old classical media of the universities, and booksellers and printers were keen to meet this new market. Lexicographers were keen to introduce new words, like maturity, from Latin, as part of the necessary augmentation of our language. English could not escape the influence of the classical languages in the age of the Renaissance, as the revival of learning produced a new group of scholar-writers from Thomas More to Francis Bacon who devoted themselves to the cultivation of style in Latin. Although they wrote their scholarly works in Latin, when they wrote their letters in English, they embellished their prose with Latinate words. They ransacked the classical past for words like agile, capsule, absurdity, contradictory, exaggerate, indifference (Latin) and monopoly, paradox, catastrophe, lexicon, thermometer (Greek). The scientific revolution of the time also prompted new borrowings, such as atmosphere, pneumonia, skeleton. An encyclopedia would now be required to explain the idea of gravity. Vesalius’ transformation of anatomy meant that English would need descriptions like excrement and strenuous. In physics, the work of scientists like William Gilbert were introducing words such as external and chronology. There were also further borrowings from French, like bigot and detail. Besides some specific architectural words from Italian, and some bellicose Spanish words, there were also important nautical words from the Low Countries like smuggler and reef. Sailors also brought Low Dutch into English at this time, words which are sometimes falsely attributed to the Anglo-Saxons, like fokkinge, kunte and bugger. These words are not what we would normally associate with the Renaissance, but they form part of the same desire to make English a communicative, everyday language with a broad vocabulary. Altogether, the Renaissance added as many as twelve thousand words to the English lexicon. These innovations and inventions were typical of the kind of adventurousness we associate with the Elizabethans, especially in their brave explorations of the New World. Francis Drake traveled well beyond the bounds of Christendom, circumnavigating the globe, plundering Spanish ships in the Caribbean and exploring the Americas. It was the guidance and inspiration of Drake’s fellow Devonian, Sir Walter Ralegh (pronounced Rawley), which led to the first English-speaking communities in North America. A lesser-known adventurer was Thomas Cavendish of Trimley St Martin in Suffolk. He was one of the many sea dogs who served Queen Bess and his own pocket by harassing Spanish shipping and settlements in the Americas. In 1586 he decided to emulate Drake’s great exploit of sailing around the globe. Setting out with three ships, he completed the incredible journey in a little over two years. In 1591 he set out to repeat the venture in order to open up commercial relations with the Orient, but was worn down by storms and disease, dying off the coast of Brazil, where he was buried at sea. The story of what was to become the first North American settlement starts in the late 1570s when Sir Humphrey Gilbert, under charter from Elizabeth, claimed Newfoundland for England. (One of his fellow explorers was a Hungarian, about whom I have written elsewhere.) Heading South, Gilbert was then drowned in a storm with the famous last words, We are as neer to heaven by sea as by land. Sir Walter Ralegh then took up the cause of founding a new colony, temporarily establishing the Cittie of Ralegh in Virginea, on today’s coast of North Carolina. The story of The Lost Colony, as it became known, exemplifies the adventurous mariners of the Elizabethan era, but also shows how hazardous and difficult the settlement of the New World was. Ralegh, now out of favour with the Crown, continued to express his undying faith in an English empire overseas. With hindsight, the colonisation of the new huge land-mass of North America by English-speaking settlers seems inevitable and Ralegh’s boast to Sir Robert Cecil in 1602, that he would yet live to see it an English Nation might not seem so idle, had he been allowed to live on. However, at the time neither Ralegh nor the prospective settlers could envisage what they were taking on, let alone confront the harsh realities of the new frontier on the other side of the ocean. In the meantime, raiding and trading was continuing to prove far more lucrative. I thank God I am endowed with such qualities that if I were turned out of the realm in my petticoat, I were able to live in any place in Christendom. In reality, the threat of 1588 failed to strike much of a patriotic fire in the coastal towns of Suffolk. The decayed coastal defenses had to be rapidly repaired and when the eastern ports were required to provide a quota of ships for the royal fleet they all pleaded poverty. The Spanish wars had already caused them severe loss of trade, they argued, and they could only afford a fraction of the ships needed. When the time came for the county levies to assemble before their Queen at Tilbury, the men of Suffolk had to be cajoled once more, for they were reluctant to leave their farms at harvest time and even more reluctant to leave their county. In the event, they were not really needed, as Drake’s fireships scattered the heavy Spanish galleons, laden down with heavy cannon and balls which disintegrated on impact, and God’s wind did the rest. The long war with Spain disrupted the cloth trade with the Spanish Netherlands, an important cause of its decline, or rather of transition, with old draperies giving way to new ones. The old system had been badly hit not just by wars and market changes, but by the introduction of new techniques and the growth of monopolies. The planting of European colonies in Africa and the Americas provided new and often captive markets for the goods of the Old World, but the requirements of these new consumers were not the same as those of England’s old trading partners. The inhabitants of tropical and sub-tropical lands did not want to drape themselves in heavy Suffolk broadcloth. The county’s clothiers could probably have risen to this challenge as they had to previous market changes, but powerful mercantile groups saw regional specialisation as the solution to the problems. Fulling could be carried out more efficiently and cheaply in counties like Yorkshire with its abundant supply of fast-flowing tributaries running off the Pennine moors into its great, navigable rivers, flowing into the North Sea. Within a few years, Suffolk’s small-scale yet integral fulling industry dwindled and many craftsmen had to take to the Great North Road to find work. Growing control over the East Anglian industry was being exercised by London merchants, most of whom belonged to trading companies which had official or unofficial monopolies in large trading areas overseas. These merchants could therefore combine to outbid the local clothiers for yarn and to pay more for unfinished cloth than the exporters of Ipswich and Colchester. Suffolk clothiers who tried to break these monopolies were frequently prosecuted through a growing volume of legislation. The erosion of free trade by sharp mercantile practices led to prohibitions and restraints of trade which, in 1588, left the merchants of Ipswich unable to transport Suffolk cloths even to the continent, and especially to Spain. By the second decade of the seventeenth century, this stranglehold on trade had left the cloth industry in Suffolk extremely exposed to the sharp practices of some unscrupulous London merchants. In 1619, one Gerrard Reade refused settle payment with eighty Suffolk clothiers for the cloths he had already sold for twenty thousand pounds. The Suffolk magistrates complained that the work of at least five thousand weavers was at stake. The clothiers did not have the funds to pay them, having not been paid themselves for the cloth, and were they to be thrown on the parish for relief, there would not be enough funds to relieve them. The clothiers reacted to these pressures by banding together themselves into local organisations capable of resisting them. A company of cloth-workers was formed at Ipswich in 1590, with the avowed intention that the said mysteries and sciences may be better ordered, the town better maintained, and the country near about it more preferred… A similar trade organisation was formed at Bury in 1607. However, they failed in protecting local trade from the tycoons in London. What they did achieve was to help the clothiers to restrict the wages and impose strict conditions upon the craftsmen who worked for them and who were already experiencing severe hardship. They also tried to restrict to check the import of new, lightweight cloths from the Low Countries, but the Flemish weavers were producing a fabric which, while warm, was easier to work and lighter to wear, and whose popularity was therefore irresistible. Many Suffolk craftsmen, especially the persecuted puritans among them, decided to practice both their trade and their religion in the Netherlands, before some later emigrated with the Pilgrim Fathers to New England. At the same time, some cloth-makers had been copying the skills of earlier Flemish immigrants, turning their attention to spinning yarn and weaving new draperies. These new cloths included fustian, bay, say and stuff. The Suffolk centre for these was Sudbury, but the kembing (spinning) of yarn was more widespread. At first the spinners were independent and made their own arrangements for selling the yarn in London or Norwich, but before long merecantile capitalists took over the organisation of the industry. In Tudor times, fishing, shipbuilding and coastal trade continued to be thriving activities along the coasts and estuaries. Two hundred or more ships out of ports of Lowestoft, Southwold, Walberswick, Dunwich, Aldeborough and Orford plied the North Sea herring grounds and Icelandic cod fields throughout most of the sixteenth century. In 1572 these ports, together with Ipswich and Woodbridge owned 146 coastal trade vessels, carrying cloth, oil, flax, hemp and wine across the Narrow Seas and plied along the coast with timber, fuller’s earth, hides and Newcastle coal. The growth of maritime enterprise in these times brought prosperity to the shipyards of Ipswich and Woodbridge. Ipswich was the principal supplier of large merchant ships to London, and thousands of Suffolk oaks went into a succession of fine vessels. Woodbridge was always a close rival to its neighbouring port but Ipswich added to its prosperity by producing the cordage and sail canvas. By the turn of the century business was booming and a succession of fine ships were laid down, including the 320-ton Matthew in 1598. However, coastal erosion posed a continual threat to the east coast ports, in particular, Dunwich. In 1573, The Queen’s majesty’s town was by the rages and surges of the sea, daily washed and devoured. The haven was so badly silted that no ships or boats could get either in or out, to the utter decay of the said town. Year after year more houses, churches and sometimes whole streets simply vanished. The inhabitants lacked the technical skill and resources necessary to construct sea defenses and, despite desperate pleas for help, there was none forthcoming from the government. Southwold was also fast silting up by 1620 and fishermen could no longer rely on access to the harbour at Walberswick. These ports were also plagued by piracy, which had become particularly virulent in the North Sea from the late sixteenth century. Operating out of Dunkirk, Ostend, Sluys and Nieuport, the privateers caused havoc to coastal and international shipping. In 1596 a small fleet of Dunkirkers blockaded Harwich and in 1602 east coast merchants were forced to adopt a convoy system. In 1619 a national subscription was raised to relieve the people of Dunwich, Southwold and Walberswick whose misfortunes were, in part, blamed on pirates. In 1626 a Dunkirk privateer sailed into Sole Bay at Southwold with guns blazing. While the townsfolk fled from the harbour the pirates cut out a merchant ship and made off with her. Between 1625 and 1627 no less than thirteen Aldeburgh ships of a total value of 6,800 pounds were lost to pirates. Despite these problems, many Suffolkers were as proud of their mother-tongue, in all its vernacular plainness, as they were of defying the pope and denying the might of Spain access to their island’s shores. Some writers such as Ben Johnson and even Shakespeare himself wanted to defend the language against the incursions of Latinate terms, calling them inkhorn terms and showing a preference for plainnesse. When Berowne finally declares his love for Rosaline in Love’s Labour’s Lost, he announces that he will shun taffeta phrases, silken terms precise, and instead express his wooing mind … in russet yeas and honest kersey noes. The combination of these twin traditions, homespun and continental, led to the emergence of a language, to quote Logan Pearsall Smith of unsurpassed richness and beauty, which, however, defies all the rules. Almost any word could be used in any pat of speech, adverbs could be used for verbs, nouns for adjectives, and nouns and adjectives could take the place of verbs and adverbs. In Elizabethan English, you could happy your friend, malice or foot your enemy, or fall an axe on his neck. Shakespeare himself wrote of how he could out-Herod Herod, ask that ye … uncle me no uncle and describe how she might tongue me. When Shakespeare moved to London, he would have encountered the speech of the court, which was sufficently different from the standard speech of a market town like Stratford for a sharp-eared contemporary to note what he called a true kynde of pronunciation (what, today, we would call received pronunciation). We find some clues as to how this might have sounded in Shakespeare’s own plays, where he puns with minimal pairs like raising and reason, which would then have sounded much more like its French original, raison. Similarly, in All’s Well that Ends Well, a lot of the humour is conveyed in language rather than action, based on exchanges of puns as with the words grace and grass, much more similar among the courtiers then than they are now. Shakespeare would also rhyme tea with tay, and sea with say. Elizabethan English would have sounded much more like the English of Banburyshire, Warwickshire and Worcestershire to twentieth-century ears than that of East Anglia, London and the South-East. However, it was the English of London and East Anglia which was first to take hold in Massachussets, the language of the rigorous Puritan mind. The text owed much to earlier translations, especially that of Tyndale, but also to the scholarship of John Bois in ensuring the faithfulness of the overall text to the original Hebrew and Greek. He was born in 1560 and grew up East Anglia, reading the Hebrew Bible at the age of six, and becoming a classics scholar at St John’s College at fourteen. He passed through the examinations at record speed, and soon became a Fellow of the College. When this expired he was given a rectorship at Boxworth, an isolated hamlet a few miles north of Cambridge, on condition that he married the deceased rector’s daughter. This he did, moving into the Fens, but still rising at four o’clock to ride into Cambridge to teach, reading a book on horseback. Bois continued to live quietly in Boxworth, a man with a brilliant scholarly reputation. At the Hampton Court Conference in 1604, called by James I to discuss matters of religion, Dr John Reynolds of Oxford proposed a definitive translation of the Bible to ameliorate the developing friction between Anglicans and Puritans. The rex pacificus gladly assented to the idea of one uniforme translation, though he doubted whether he would see a Bible well translated in English. By June 1604 it was settled that there would be six groups of translators, two in Westminster, two in Oxford and two in Cambridge, each made up of eight scholars. John Bois was recruited for one of the Cambridge committees, and he was put in charge of translating the Apocrypha from the Greek, but his level of scholarship soon made him indispensable to other committees. The six committees were instructed to base their Version upon the previous English versions, translating afresh, but also comparing their work with that of the previous translators, from Tyndale to Parker. At the end of six years, the six committees delivered their texts to Westminster for a final review by two scholars from each centre. John Bois went from Cambridge, together with his old tutor, Dr Anthony Downes. For the next nine months in 1610, the six scholars worked together on the final draft of the AV, refining and revising the texts. Their brief was to re-work the text not just in order to make it read well, but also sound better when read out loud. In their Preface to the finished text, the translators commented interestingly on this process, addressing their remarks to The Reader. Or ever the silver lace be taken away, or the gold band be broke, or the pot broke at the well and the wheel upon the cistern, then shall the dust be turned again unto earth from whence it came, and the spirit shall return to God which gave it. All is but vanity saith the preacher, all is but plain vanity. (Great Bible). Or ever the silver cord be loosed, or the pitcher be broken at the fountain, or the wheel broken at the cistern: Then shall the dust return to the earth as it was: and the spirit shall return unto God who gave it. Vanity of vanities, saith the preacher; all is vanity. (KJV). The King James Version at once reads more clearly and sounds more poetic. It is an irony of the process by which the final text was created that only the king himself is credited with its creation. The version he only had to authorise came from the hard work of a scholarly committee, rather than a single writer. Compared with Tyndale and Cranmer, Bois is now almost forgotten. He returned to the Fens, where in 1628 the Bishop of Ely offered him a canonry at the cathedral, in which position he remained for the rest of his life, being buried in the cathedral in 1643. The King James Bible was published in the same year as Shakespeare produced his last play, The Tempest, in 1611. Both the play and the Bible are masterpieces, but there is one crucial difference between them. While the playwright used more words than ever, inventing new ones as he wrote, the King James Version employed a mere eight thousand words, God’s English for Everyman. The people for whom the new, simplified yet poetic text became a weapon saw themselves as God’s Englishmen and Englishwomen. They became known to others as Puritans. Their heartland was East Anglia, birthplace of John Bunyan and Oliver Cromwell. Besides these very English revolutionaries, about two-thirds of the early settlers of Massachusetts Bay came from the eastern counties, from Lincolnshire in the north to Essex in the south, from Suffolk and Norfolk in the east to Bedfordshire, Cambridgeshire and Huntingdonshire in the west. Throughout the seventeenth century, the villages and towns of these counties supplied the New World with a ready and steady stream of immigrants, country people with country skills who were already well adapted for the hard life of the pioneer. The speech-features of East Anglia that were transplanted to the place the Pilgrim Fathers named New England are still to be heard in the rural parts of Norfolk and Suffolk. People there still say noo instead of new and don’t sound the r in words like bar, storm and yard, very different from the burr of western English counties from rural Oxfordshire and Worcestershire down to Dorset and Devon. Many, perhaps most, were Puritan dissenters, or separatists, who would not conform with the liturgy and practices of the Church of England, and their story became the story of American English. Their motives were a tangle of idealistic, colonising, self-interested and religious ambitions. The Pilgrim Fathers went to escape, in the words of Andrew Marvell, the Prelate’s Rage. They were also escaping from a monarch of Great Britain who hated both Scottish Presbyterians and English Independents among his subjects, vowing to harry them out of the land. Their impulse to migrate was both profoundly conservative and revolutionary in religious terms. They hoped to find an austere wilderness where they could establish an authentically English Christian community. They were not abandoning their East Anglian identity, but rather purifying and transplanting it. They did not see themselves as creating a new country, America, but recreating the old country, free from what they felt were the papist poisons prevalent in the national church. When the Mayflower set sail from Plymouth on 16 September 1620, the largest group on board came from East Anglia, but they represented thirty different communities from all over England. These can still be seen in the place-names of New England… Boston, Bedford, Braintree, Cambridge, Lincoln and Yarmouth. By the middle of the seventeenth century, there were some already a quarter of a million colonists on the North-Eastern seaboard of North America, mainly from London and the eastern counties. By the time The Tempest was written, England had been given a renewed identity by the first Elizabethan age, and, though the Essex Rebellion, late in 1601 and the Midland Rebellion of the Catholic gentry of 1605 threatened to disrupt this new vision, it became a vision of Great Britain. Under the dual monarchy of the Stuart kings, this was to become more than simply a geographical entity, Grande Bretagne as opposed to little Brittany, but a vision of an island and an independent people chosen by God for great deeds and heroic achievements. The expression of this is found not only in Shakespeare, but also in Spenser’s mythical history of Britain in The Fairie Queen and in the great antiquarian work, Camden’s Britannia. History, or rather national mythology, was to become a potent political force in the seventeenth century, with the myth of the Norman Yoke and the legends of Robin Hood finding their usage among counter-cultural nonconformists. A later visionary portrayal of the unity of Britain appears in Blake’s prophetic poems, in which he sees the dawning of a new form of consciousness when sleeping Albion, the spiritual essence of Britain, will awake with the light of the Divine imagination and be joined to his female emanation, Jerusalem, a holy shrine re-built in England’s green and pleasant land. In one of the versions of the Glastonbury legends preserved among Cornish and Somerset miners, on which Blake based his poem, Jerusalem, now England’s alternative national anthem, Joseph of Arimathea had visited Avalon, Ynys yr Afal (Apple Island in the Cymric), bringing with him the young Jesus of Nazareth who, as a trained carpenter, built a shrine made of wattle and daub, dedicating it to his mother. Even the coronation oath of both Elizabeth I and II refers back to the mythology of a Christianity dating back to the time of Joseph’s second visit, sent by the Apostle Philip in 63 A.D. with a band of missionaries, to establish the Christian faith in Britain. As the last Welsh-speaking monarch, Elizabeth, like the first, her grandfather, was not averse to using popular British legends as propaganda, to point out to a Papacy about to excommunicate her that she owed her title as Defender of the Faith not to the Bishop of Rome, nor even to St Augustine, but to the ancient British saints and rulers who went into battle with pagans, like Arthur, carrying crosses and pictures of the Virgin Mary, as well as their dragon emblems. After Blake, the legends were again reinterpreted in the Gothic and Celtic revivals of the Victorian period, inspiring both Anglo-Catholics and Pre-Raphaelites, especially Edward Burne-Jones, who created so much of the stained glass for churches built in this period. Any traces which may have remained of this most ancient shrine to Mary were destroyed by a great fire in 1181. All that survives to claim credence for the legend is The Glastonbury Thorn, marking the place called Wearyall, a hill on which Joseph thrust his hawthorn staff into the ground and it immediately burst into blossom, though it was winter. It still blooms around Christmas-time. The branch is on one of the several trees descending from the one, thought to be the original, which was cut down at the Dissolution. Originally surrounded by marsh and water, the four-hundred-foot Tor (which means rocky outcrop in the Cymric), with its fifteenth-century tower of the ruined St Michael’s Church, the site of the abbey and the town to its west, all formed an island until the Somerset levels were drained in Stuart times. The association of this island with Arthur’s resting place received a great boost when, a decade after the great fire, a monk apparently discovered the coffin of Arthur and Guenevere. The resulting flood of pilgrims must have helped to fund the abbey’s rebuilding, by the thirteenth century, but this early tourist industry was also what led to its ultimate destruction. Nevertheless, few of the ruins of the Dissolution bring about such a pang in the visitor as those of Glastonbury, whether because of the destruction of a great architectural work of an abbey rebuilt in the Transitional and Early English styles, or because of the psychological damage done to both England and to the British Isles as a whole by the sudden and violent denial of a contemplative tradition in the expulsion of the monks. Excavations have shown traces of the original British monastic settlement, first recorded as existing in 658, and there are strong traditions that St Patrick, St Brigid and St David all visited the monastery. Re-founded by King Ine of Wessex in the eighth century, ravaged by Danes in the ninth, the abbey began its great period in 940 under Abbot Dunstan, who later became Archbishop of Canterbury. We know, from the chroniclers, that some of the Kings of Wessex were buried there, including Edmund Ironside, in 1016, but there no Anglo-Saxon remains have yet been discovered. Ascending to the summit of the Tor, the modern-day pilgrim stands on the place where in 1539 Richard Whiting, the last abbot of Glastonbury, was executed as a traitor on Henry VIII’s command. After the death of the previous abbot in February 1525, the community elected his successor per formam compromissi, which elevates the selection to a higher ranking personage, in this case Cardinal Wolsey, who obtained King Henry’s permission to act and chose Richard Whiting. The first ten years of Whiting’s rule were prosperous and peaceful. He was a sober and caring spiritual leader and a good manager of the abbey’s day-to-day life. Contemporary accounts show that Whiting was held in very high esteem.The abbey over which Whiting presided was one of the richest and most influential in England. Glastonbury Abbey was reviewed as having significant amounts of silver and gold as well as its attached lands. About one hundred monks lived in the enclosed monastery, where the sons of the nobility and gentry were educated before going on to university. Whiting had signed his assent to the Act of Supremacy when it was first presented to him and his monks in 1534. Henry sent Richard Layton to examine Whiting and the other inhabitants of the abbey. He found all in good order, but suspended the abbot’s jurisdiction over the town. Small injunctions were given to him about the management of the abbey property. Whiting was told a number of times over the years which followed that the abbey was safe from dissolution. Item, Certayn persons to be sent to the Tower for the further examenacyon of the Abbot, of Glaston… Item. The Abbot, of Glaston to (be) tryed at Glaston and also executyd there with his complycys… Item. Councillors to give evidence against the Abbot of Glaston, Rich. Pollard, Lewis Forstew (Forstell), Thos. Moyle. As a member of the House of Lords, Whiting should have been condemned of treason by an Act of Attainder, and beheaded, but his execution was an accomplished fact before Parliament met. Whiting was sent back to Glastonbury with Pollard and reached Wells on 14 November. There some sort of trial apparently took place, and he was convicted of robbing Glastonbury Church. The next day, Saturday, 15 November, he was taken to Glastonbury with two of his monks, John Thorn and Roger James, where all three were fastened upon hurdles and dragged by horses to the top of the Tor, overlooking the town. Here they were hung, drawn and quartered, with Whiting’s head being fastened over the west gate of the now deserted abbey and his limbs exposed at Wells, Bath, Ilchester and Bridgwater. His gruesome death at so peaceful a place was symbolic of how 1539-40, the year of the Pilgrimage of Grace, the dissolution of the great monasteries and the official publication of the Bible in English, marked the key point of transition to the development of a distinctively English form of Christianity, based on the word, rather than on the image. Henry Tudor reigned for twenty-four years, established the power of the monarchy over the nobility, kept England out of foreign conflicts and passed on a full treasury to his son. He also left a Suffolk churchman close to the throne, a man who was to dominate affairs of state for most of the next reign. Thomas Wolsey was the son of a grazier, a supplier of wool and meat to the clothiers and townsfolk of Ipswich, where a half-timbered house in Silent Street is still claimed as his birthplace. He entered the Church and used it as a pathway to royal service. He so impressed Henry VIII with his capacity for hard work and his grasp of state matters that the young King was soon happy to leave these matters in Wolsey’s hands. The rise and fall of the great Cardinal are part of national history, but Wolsey never forgot his origins, and the town never forgot him. There is even a stained glass panel of him in the County Library. He himself built a college at Ipswich which, had it survived his downfall, might have established Ipswich as England’s third university city, completing a neat triangle with Oxford and Cambridge. At these universities, emancipated scholars with Renaissance ideas were challenging the accepted beliefs and traditions of the Church. Like the Lollards before them, they found allies in a growing number of less educated people who shared their disillusionment with contemporary society, though they were not always clear about what they wanted to put in its place. Most of this disenchantment and discontent expressed itself in attacks on the religious establishment. This was strongly represented throughout East Anglia, particularly through the great abbeys which, through the trade in pilgrimage and its control of land, dominated both town and countryside, from Bury St. Edmunds in Suffolk to Walsingham in Norfolk. In previous centuries, the simmering resentment of peasants and citizens alike could suddenly blaze up out of control, into white-hot rage, and anti-clericalism was by no means restricted to small urban areas, as the Peasant’s Revolt and the growth of Lollardy had demonstrated. Neither was anti-clericalism the only cause of discontent at this time. It was closely linked to social and economic causes, especially to the effects of enclosure in increasing poverty and vagrancy in Tudor times. The growing wealth of the trade in wool and woollen cloth was leading both to the growth of the newly enriched ranks of the gentry and to the dispossession of people on their lands in favour of sheep. The monks of Coombe Abbey in Warwickshire enclosed whole manors which came into their possession, in order to convert the huge acreage into grazing for sheep. The Golafres of Gnosall in Staffordshire had also married into the Knightleys of the same county, who by the fifteenth century had moved to Fawsley Hall in Northants, from where they married into the Spencer family of Althorp. The effects of early enclosures by the gentry were being felt at this time. In 1498 an inquest jury recorded that sixty villagers had been evicted from the Althorp estate, and left ’weeping, to wander in idleness’ had ’perished in hunger’. New wealth, with no great affinity for the feudal responsibilities as well as rights of landholders was spreading across the countryside seeking out new property. Tudor government was soon to help them acquire it, by taking it from the monks at Coombe Abbey (above) and giving it to the likes of Sir John Harington. Many Suffolkers resented the parish priests to whom they paid burdensome tithes, however marginal their surplus harvest might be. Many of these priests were no more virtuous than themselves and, by contrast with thrifty, hard-working merchants who re-built the churches they said mass in, they were often less so. The standard of education among the parish clergy was often abysmally low, especially in Latin, which was the language of all church services. They mumbled their way through these, hardly understanding a word themselves, yet they were supposedly performing the miracle of transubstantiation at the mass, saying the words which turned the wine and bread into the blood and body of Christ. They also had to hear the confessions of their flock, mediating between them and God, and imposing sanctions on them for moral misconduct. King Hal seemed, at seventeen, a paragon of the Renaissance Prince – handsome, athletic and intelligent, as at home in religious disputation and debate as in jousting and hunting. Yet, even then, something happened to him which made him doubt the efficacy of the rites and rituals associated with his faith. All his children by Catherine of Aragon had died in infancy, except for Mary, and on the birth of yet another infant son he made the pilgrimage to Walsingham himself to pray for the baby. However, the boy died like all the others, and Henry, enraged within his grief, had the monks expelled, and the beautiful buildings of the priory, all except the east end of the Church, and its healing wells, were destroyed, plundered for their stone, and fell into ruins over the centuries. the charity of many people grows cold; no love, not the least devotion remains in the people, but rather many false opinions and schisms against the sacraments of the Church. Within four years his beloved priory had been stripped of all valuables, its lead roof removed, its coloured glass smashed and its deserted walls left open to the weather and those seeking free building materials. Henry VIII’s attack on the monasteries began in 1535 when royal commissioners made a lightning tour of all religious foundations in order to discover reasons, or excuses, for closure. However, it had been Wolsey himself who had inadvertently added to the vulnerability of the smaller monasteries. In 1527 he had been casting around for funds for his colleges at Oxford and Ipswich. He had obtained papal bills for the suppression of a number of small religious houses whose numbers had dwindled in size. Many of them were in his native county, including the priories of Snape and Rumburgh, and St Peter and St Paul in Ipswich. The lesson was not lost on the King or on Wolsey’s young secretary, Thomas Cromwell. The middle years of the sixteenth century were tumultuous times. In the 1380’s, John Wycliffe had been denounced as a heretic for his translation of the Bible from Latin into English, the Angel not the angel speech, as one contemporary commented. He went on, and so the pearl of the Gospel is scattered abroad and trodden underfoot by swine. So Wycliffe and his dissident Lollard movement had been rigorously suppressed. The orthodox view was that to make the Bible accessible to the common people would threaten the authority of the Church, and lead the people to question its teaching. Similarly, when William Tyndale published his translation of the New Testament from the original Greek in 1525, he entered into a conflict that eventually brought him to the stake (see inset above). Translating and publishing God’s word in the language of the people was a revolutionary act. However, in 1534, the English Reformation reached its turning point when Henry VIII defied the Pope and broke with the Roman Church. The following year, Coverdale, Tyndale’s disciple, published his vernacular translation of the Bible (see picture above). This was the turning point in the history of the English language. Between 1535 and 1568 five major versions were printed, including Cranmer’s Great Bible, which had Henry’s official seal (on the right is the title page, in which King Henry VIII is pictured giving copies to Archbishop Cranmer and Chancellor Thomas Cromwell, who in turn distribute them to the people, loyally shouting ‘Vivat Rex’. All were immediate bestsellers, and were the most widely read texts of the sixteenth century in English, with an enormous influence over the spread of the language as well as the egalitarian ideas contained within them. In 1536 all small religious houses were closed down. A few were in a state of decay, but the majority were simply valued at less than two hundred pounds. This was the reason why the nuns of Campsey Ash and Bungay were turned out, as were the Benedictine monks of Eye who had been established there at the time of the Conquest. 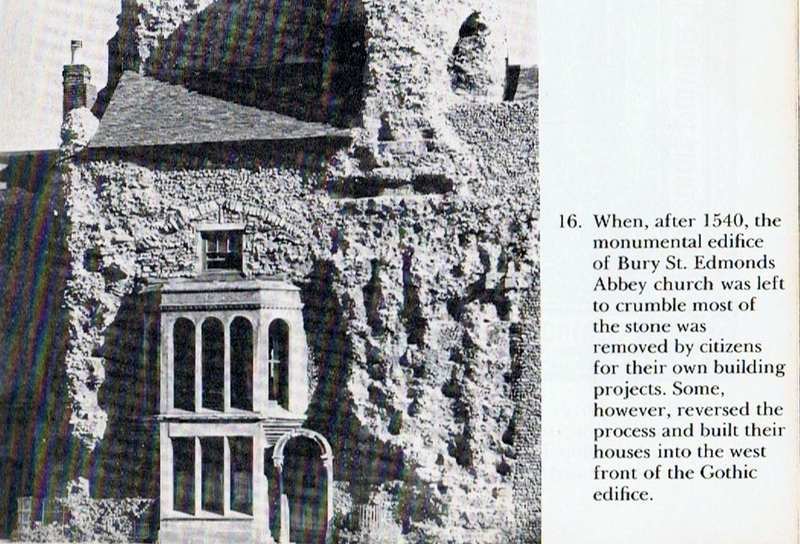 The dissolution of Leiston Abbey also dates from this time (see the photos of the ruins below). After the suppression the king bestowed the abbey on his brother-in-law Charles Brandon, Duke of Suffolk. A farmhouse was built into the corner of the nave and north transept and the abbey ruins were used as farm buildings, the church itself being used as a barn. The Duke of Norfolk, Thomas Howard, had his eyes on the lands of the Cistercian Abbey of Sibton, and used his patronage to install William Flatbury as Abbot in 1534. Flatbury then acted as the agent of Cromwell and Howard in persuading his brothers to surrender the Abbey in return for assured pensions. Thus, although Sibton was worth more than two hundred pounds in 1536, it was surrendered to the Duke in 1536. The Northern Rising, or Pilgrimage of Grace, against the religious changes was quickly and savagely put down in 1536, with Thomas Howard, the third Duke of Norfolk, playing a major role. He had succeeded to the title in 1524 upon the death of his father the 2nd Duke. One of the last of the old nobility, Howard found an early enemy in Cardinal Wolsey, whose destruction he helped to effect. He was active in battle and diplomacy throughout the whole of the reign of Henry VIII. He was present at Flodden; at the suppression of the `Prentice Riots’ in 1517; in the varying skirmishes against the Scots; in Spain and France; and in Ireland where he was Viceroy for about two years. Norfolk rebuilt the huge family mansion at Kenninghall, near Norwich, because Framlingham, like other castles had become outdated as a domestic residence. Norfolk’s private life was disturbed by contentions with his second wife, Elizabeth Stafford, daughter of the 3rd and last Duke of Buckingham. He first married Anne, daughter of Edward IV, who died childless in 1512. Howard seems to have been as cruel and uncompromising in his dealings with his relatives as he was with his enemies in and out of Court. Though he promoted two of his nieces, Anne Boleyn and Catherine Howard, to be Queens of England for purposes of family advancement, he felt able to abandon them (and indeed pass sentence of death on Anne) in their time of need. His treatment of the Catholics during the Pilgrimage of Grace was the subject of an apology from the King himself. However, Howard’s cruel crushing of the rebellion enabled Henry and Cromwell to move against the larger monasteries. Early in 1538 the Keeper of the King’s Jewels, Sir John Williams, arrived in Bury with a party of workmen. They marched into the great church and set to work with picks, hammers and chisels on the shrine of St Edmund. Henry and Cromwell had decided that the new religious ideas were right insofar as they complained of the superstitious influences of pilgrimages. With some difficulty, they removed the gold, silver, emeralds and various other precious stones, but left the Abbot very well furnished with plate of silver.By this time the royal strategy for the Dissolution had proved almost total successful in Suffolk. The friaries had all disappeared in 1537-8 and, of all the ancient monastic establishments, Bury St Edmund’s Abbey stood alone. Abbot John Reeve resisted until November 1539. Then, in return for an enormous pension, the highest granted to any abbot, he surrendered his office. From a nearby house, he watched the carts carry away the Abbey’s vestments, silver plate, books, bells, and rolls of lead from the roof, while crowds of townspeople cheered before falling upon the ruined buildings to see what they could scavenge and to cart away loads of stone for their own use. This was too much for the old Abbot, and he died at the end of March 1540, without drawing a penny of his pension. Most of the newly acquired church lands were disposed of through the Court of Augmentations in the form of grants to royal servants and sales to land speculators. By far the largest beneficiary was Charles Brandon, now Duke of Suffolk, after the execution of the last of the de la Pole Duke. The Dissolution of the Monasteries swept away the active life of many of the holy places of the Middle Ages. The monks and nuns were expelled from their monasteries and convents and pensioned off, apart from those executed for active or suspected resistance to Henry VIII’s designs. The shrines and sites of pilgrimage were largely destroyed, together with venerated images and relics. The lands and buildings of the abbeys passed first into Henry’s possession and then into the hands of established and up-and-coming families. This wholesale expropriation gave rise to the biggest territorial and social upheaval in British history. In a prosperous county like Suffolk, there were many men able and willing to compete for monastic land. Neither was it just church land which came onto the market, but a large number of manors, estates and parcels of arable land, which gave opportunities for men of all degrees from great magnates to yeomen farmers to exchange, buy and sell property in order to consolidate their holdings. Yeomen farmers found it easier to consolidate their holdings in Suffolk than elsewhere where the feudal strip systems continued to complicate the land tenure. By 1536 many small freeholders had built up farms which could be simply and efficiently operated. Now they could add to these holdings by purchase, exchange and marriage. However, it was the official publication of the English Bible in 1539 which brought religious discord out into the open. In 1545, Henry VIII himself was driven to complain that, that most precious jewel, the Word of God, is disputed, rhymed, sung and jangled in every alehouse and tavern, contrary to the true meaning and doctrine of the same. Priests and objects of superstition were attacked. Preachers, licensed and unlicensed, wandered from church to church, market to market, and from one village green to another, planting new conviction in the hearts of some and confusion in the minds of many. The Lady Chapel of Ely is a superb example of the most ornate fourteenth-century church architecture, richly decorated with hundreds of stone carvings of saints and holy figures. In 1539 every face was smashed by religious zealots in one of the earliest acts of desecration done in defiance of the established church. Alice de la Pole (granddaughter of Geoffrey Chaucer) had retained direct control of the family seat of Ewelme in Oxfordshire until her death in 1475, when the manor passed to her son John (d. 1492), Second Duke of Suffolk and brother-in-law to both Edward IV and Richard III. The last surviving legitimate male Plantagenet claimant to the throne, the Earl of Warwick, had died on the scaffold in 1499. The Second Duke was succeeded by his second son Edmund, who was demoted to the rank of earl by Henry VII and fled abroad in 1501, prompting the seizure of his estates. Formally attainted in 1504, he was imprisoned from 1506 and executed in 1513. However, the Poles did not give up their claim to the throne until 1525, when the younger of the two surviving brothers was killed at the Battle of Pavia. The fact that the Yorkist cause lived on for forty years into the Tudor dynasty shows how fragile the Tudor royal line really was, descended through the illegitimate child of John of Gaunt. Ewelme was one of several manors vested in trustees for the life of Edmund’s widow, but it was controlled by the Crown and granted to the new Duke of Suffolk, Charles Brandon, in 1525. Henry VIII took it back in 1535, when he also obliged Brandon to exchange most of his Suffolk estates for lands in Lincolnshire, so that, after 1536, Grimsthorpe in that county became the principal seat of the Dukes of Suffolk. Meanwhile, a paranoid Henry VIII carried on a vindictive campaign against the Pole family after the son of Margaret Pole, the Countess of Salisbury’s son, Cardinal Reginald Pole, penned a stinging attack against the King’s divorce, from exile in Italy. This resulted in the execution of one of his brothers in 1539 and the suicide of the other. Margaret, the daughter of the Duke of Clarence, was an old woman in 1541, once the governess to Mary Tudor, whose mother’s betrothal to Arthur, Prince of Wales, had caused the execution of her brother, Edward Plantagenet, the rival claimant to the throne. Despite this, she became a loyal Tudor courtier. However, because she was also a Neville, she was accused of complicity in the Northern Rebellion, and sent to the Tower without trial. From there she was executed in May, after ten or eleven blows of the axe. When Mary became Queen, her son became the last Roman Catholic Archbishop of Canterbury, and she herself was beatified by Pope Leo XIII in 1886. Her granddaughter became a close friend of Elizabeth I. Perhaps by coincidence, in 1550 Ewelme was among the estates settled by Edward VI on the Princess Elizabeth. It remained in royal possession until 1628. At the end of Henry’s reign, when the succession was of doubtful continuance in the light of two daughters having been declared bastards and an only son who was sickly, inter-Court rivalry reached a peak over the protectorate of Edward VI. On the one hand were the Seymour brothers, Edward’s uncles, and on the other, the Duke of Norfolk and his son the Earl of Surrey. Surrey acted rashly in the matter of armorial bearings and charges of treason were successfully, if unreasonably, pressed. Surrey lost his head and his father would similarly have died had not the King himself died during the night prior to the day fixed for Norfolk’s execution. Howard spent the next six years in the Tower. In the reign of Henry’s son, Edward VI, under the guidance of Archbishop Cranmer, an episcopalian Protestantism with an English liturgy was established as the state religion. When, in 1553, the boy king died, John Dudley, Duke of Northumberland, the de facto ruler of England from 1549, tried to exclude his sister, Mary, the Catholic daughter of Catherine of Aragon, from the succession by setting Lady Jane Grey on the throne. She was the granddaughter of Henry VIII’s sister, Mary, and Charles Brandon, the Duke of Suffolk. The Commons of England were almost unanimous in rejecting Northumberland and his protégé, and the people of Suffolk soon had an opportunity to demonstrate their feelings in a practical way. Mary was at Hunsdon, near Hertford, when the news of this attempted coup d’etát broke. She moved away northwards towards Cambridge when a messenger from London caught up with her and demanded her urgent return to the capital, advising her that the East Anglian ports had been blocked, rendering escape impossible. Mary sojourned at Sawston Hall, south of Cambridge, and then turned into Suffolk. She attracted support from nobles and commons alike, and received a royal reception at Bury, but Northumberland’s forces were already on the road, so she could not remain there in safety. She made her temporary headquarters at the Duke of Norfolk’s house at Kenninghall near Thetford, where she summoned all the local nobility and gentry to come to her aid with men and arms. She also ordered the release the old noble, also keeper of Framlingham Castle, the Duke of Norfolk, from the Tower of London. He was aged eighty, and died at Kenninghall within the year. His was a momentous life. He has been called a cruel man, but one who lived in cruel times. For over thirty years he had been one of the most powerful and active men in Tudor England, and perhaps his greatest triumph was that he survived in his important offices so close to a despotic King, dying in his bed and not upon the block. His magnificent tomb, and that of two of his wives, is in Framlingham Church (pictured right). By the time she set out for Framlingham on 14 July, Suffolk had committed itself. A sizeable army encamped around the fortress under the leadership of the Sheriff, Sir Thomas Cornwallis, Sir William Drury and Sir William Waldegrave. Two days later, Northumberland’s men, on reaching Cambridge, heard rumours that Mary commanded thirty thousand men in arms. Their refusal to advance to Framlingham sealed the Duke’s fate. Mary was proclaimed Queen and quickly selected a council from among her supporters, emptied the prisons to swell her army, and secured the support of the main towns and east coast ports. All opposition to Mary becoming Queen collapsed totally and swiftly. As she made her way slowly through Suffolk and Essex a few days later it was at the head of a triumphant procession, not a cautious army. Towns and villages greeted the rightful heir to the throne who would, they felt, heed their petitions, and deliver them from self-seeking landlords. Yet this mood of celebration was soon replaced by one of disillusionment and hatred. Queen Mary could do little to re-establish the monasteries whose lands now belonged to families professing Catholicism on whom she depended for support, and the landlords, old and new, remained in power. The clothiers continued to keep as large a gap as possible between wages and prices, and destitution and vagabondage increased. Added to all these ills was a religious persecution of unparalleled savagery. Examinations and imprisonments began in 1554. Parish clergy were expelled from their livings for refusing to reinstate Catholic rituals. Women were encouraged to denounce their neighbours, and houses were searched for Protestant books. Heretics were cajoled, bullied, threatened and bribed into submission and recantation. There were many who would not recant, and so, in February 1555, the burnings started. Among the first to suffer martyrdom was Dr Rowland Taylor, the incumbent of Hadleigh. Ever since the time of Little Bilney, Hadleigh had remained an important centre of Protestantism. Taylor was appointed rector in 1544, and many of his parishioners became exceedingly well learned in the holy scriptures, so that a man might find among them many who had often read the whole Bible through…so..that… the whole town seemed rather a university of the learned, than a town of cloth-making and labouring people. Taylor was openly hostile to the religious policy of the Marian government, and therefore attracted a great deal of support from the ordinary people of Essex and Suffolk. When the Bishop was sent to say mass in Taylor’s church, he was turned away. Taylor was then called to London, where he was subjected to many trials and repeated examinations. He defended himself cheerfully, and refused to recant, so he was condemned to the stake and degraded from his orders. He was brought back to Hadleigh for his execution, and crowds of parishioners thronged the town to encourage him in his ordeal. So, the first Suffolk martyr perished on Aldham Common on 9 February 1555, where a stone monument marks the spot. A further seventeen men and women from the county died for their faith, and many more suffered ill-treatment, harassment and torture. He was soon to be followed to the stake by his Archbishop, Thomas Cranmer, who was, of course, the architect of the English Protestant Church. He was born at Aslacton, Nottinghamshire, and educated at Cambridge. He was a quiet scholar, but was summoned to Canterbury following the advice he had given on Henry’s divorce. He was well-respected by Henry throughout his turbulent reign, as the picture showing the course of the English Reformation demonstrates, with Henry pointing to his son and successor, with the Archbishop standing beside him as advisor. Cranmer was a godly man, Lutheran in theology, well read in the church Fathers, a gifted liturgist with a superb command of English. He was sensitive and brave, but cautious and slow to decide in a period bedeviled by turbulence and treachery. Cranmer preferred a reformation by gentle persuasion, rather than by force. Like Luther, he believed in the role of the godly prince, who had a God-given task to uphold a just society, and give free scope to the gospel. He was responsible for the Great Bible and its prefaces; the Litany of 1545 and the two Prayer Books of 1549 and 1552. The driving force of Cranmer’s life was to bring about a restoration of the Western Protestant Church to the Catholic faith. When the Church of Rome refused to be reformed, Cranmer took it upon himself to reform his own province of Canterbury. He sought an ecumenical council with the Lutherans and Calvinists on the continent. He also sought to restore a living theology based on personal experience and the mission of Christ. From this doctrine came his belief in justification by faith and of Christ’s presence in the sacraments. His third doctrine was that of the Holy Spirit, which lay behind his high view of scripture and tradition, and the meaning of union with Christ. At the end he experienced a long solitary confinement, and was brain-washed into recanting. But at his final trial in 1556 he put up a magnificent defense, and died bravely at the stake. He first thrust into the fire the hand that had once written the recantations. The Martyrs’ Memorial at Oxford commemorates his death, together with those of Latimer and Ridley, whose deaths he had witnessed from prison in the previous year. Bloody Mary died childless in November 1558, but her persecution of Protestants did lasting damage to the Catholic cause, ensuring that, in future, no Catholic monarch would accede to the throne. Her attempt to impose an English Inquisition had failed, and made earthly life intolerable for many English Catholics in successive generations, when even the private practice of their faith was barely tolerated, if at all. The young Queen Elizabeth made her first progress through Suffolk five years later, but the Marian counter-Reformation had left their mark on the people and clergy alike. Although well-received by the nobility, gentry and burgesses of Ipswich, the behaviour of the local clergy made her indignant. The Protestantism which had taken root in the reigns of Henry VIII and Edward VI had been nourished with the blood of the martyrs and had grown into a strident Puritanism. Clergy refused to wear the surplice, were dissatisfied with the remnants of popery in the Anglican services and disliked the Prayer Book. Angrily, Elizabeth ordered them to conform. Some of them did so, at least outwardly, but a royal dictat in matters of religion was no longer going to make either the clergy nor the congregations of Suffolk conform against their consciences. On the other hand, the new Queen continued to face the threat from resurgent Catholicism on the continent, which encouraged the resistance to conformity among the Catholic gentry at home. The association of the Golafre name with the plots and rebellions of the early Tudor period may have been one reason why the other members of the family were glad to adopt more anglicised and ’gentrified’ versions of the name. Interestingly, the Golafre family were closely related, through the marriage of Beatrix Golafre of Satley, Warwickshire, to the Arden family, through which the writer William Shakespeare was descended. Beatrix’s grandson, Robert Ardern of Park Hall (b. 1413), was the son of a Worcestershire gentleman, who had been one of the claimants to the Fyfield estate, following the death of Sir John Golafre. In 1452, he had been executed for taking part in the uprising of Richard, Duke of York. Not surprisingly, therefore, the Ardens were continually suspected of being first rebels and then recusants throughout the Tudor Period, and one of them, Edward Arden, was executed in 1583 for plotting against Elizabeth I. He was a close relative of Mary Arden, Shakespeare’s mother, who had lived near Stratford at a gentrified farmstead in Wilmcote before moving into the town. It has often been strongly suggested that Shakespeare himself was a Catholic, hence his determination to prove his loyalty, first to Elizabeth and then to James, at a time when Midland gentry families fell under suspicion of harbouring Jesuits in priest holes, such as at nearby Baddesley Clinton, and of plotting against the Protestant monarchy and cause. They were seen as ’the enemy within’ and heavily fined for not attending their parish church and for having private masses said in their homes. The Jesuit priests who ministered to them were ’flushed out’ before and after the 1605 Rebellion, but their confessions in the state papers have left historians with detailed descriptions of the Catholic gentry of Northants, Warwickshire and Worcestershire, and of their extensive conspiratorial network across the three counties. The Margaret Golafre, or Gollafor, who had married into the Hodington (Huddington) family was probably from a prominent gentry family herself. There does appear to be a link with the older, aristocratic family, however, in that her descendents, the Huddington heiresses, Joan and Agnes, married Robert Winter and William Strensham. By these marriages, both the Winters of Huddington and the Russells of Strensham were entitled to bear the Golafre arms. The brothers Robert and Thomas Winter (Wintour), were executed (hung, drawn and quartered) in 1606 for their part in the Gunpowder Plot and Midland Rebellion of the previous year. They had both grown up at Huddington Hall. Religious unrest in Suffolk, as elsewhere in England, continued throughout Elizabeth’s reign. As her government and bishops pursued its via media (middle way), extremists at both ends of the ecclesiastical spectrum were periodically pressed to conform. A number of Catholics were fined and imprisoned if they did not attend the parish church, otherwise the government turned something of a blind eye to private masses in manor houses owned by the gentry. A show of unity, or uniformity, in public was what was essential, since the Virgin Queen’s reign was continually beset by plots and planned invasions, even after the defeat of Philip II’s Spanish Armada in 1588. Puritanism was much more of an everyday problem, however, because parish clergy, as well unlicensed preachers could easily stir up their congregations against all religion that was not pure. The Bishop of Norwich’s officers often brought offenders before the magistrates only to find, on many occasions, that the JP himself was sympathetic to puritans, if not to nonconfomists. Many of the leading county families were, by this time, of a Puritan persuasion. They patronised preachers, appointed radical clergy to their parishes, where the livings were in their gift and not that of the bishop, and even opened their houses to separatist meetings. three score ministers, appointed out of Essex, Cambridgeshire and Norfolk… to confer of the Common Book, what might be tolerated, and what necessarily refused in every point of it; apparel, matter, form, days, fasting, injunctions, etc. The rector of Cockfield, John Knewstub, was a leading light among the Puritans in West Suffolk, with others in the important centres of Hadleigh, Ipswich and Beccles. Puritanism therefore went from strength to strength in East Anglia and it is no coincidence that the first group of separatist pilgrims intending to settle permanently in the New World, or at least New England, were from Old Anglia, and that the distinctive dialect of Cambridgeshire and Suffolk can still be detected in much of the eastern seaboard they settled, remaining distinct from the Midland English which predominates across most of the United States. The Reformation may be seen as the triumph of the venacular over the old international Latin culture of Western Catholicism. Religion became a matter of the word rather than the image, of the sermon rather than the sacrament. In England the new liturgy remained much closer to the old forms it replaced and so most churches required few changes to their interiors. Churches and college chapels continued to be built and decorated in the late Perpendicular Tudor style of Gothic. Wealthy London merchants came to live in Suffolk, men like Sir Thomas Kytson at Hengrave, who built a splendid new house for himself. Local clothiers also put their wealth into land, buying themselves into an expanding gentry class. Both men and women established charities as memorials, as well as setting up elaborate tombs and monuments in brass, marble and stone in the parish churches. The history of Woodbridge has been substantially influenced by the life of its greatest benefactor, Thomas Seckford, who crowned a brilliant legal career when he became Master in Ordinary of the Court of Requests. In 1587 he decided to donate a measure of his wealth to Woodbridge by endowing charities which still pay for the hospital, almshouses, dispensary, lending library and grammar school (see photos). He was also a Tudor statesman and in 1550, 1563 and 1572 was elected to parliament by the burgesses of Ipswich. At St Mary’s Parish Church in Woodbridge, besides the tomb of Thomas Seckford (d. 1587) on the north wall of the sanctuary, there is the interesting Pitman monument on the south side of the chancel, in fine ornate marble (above far right). It commemorates Jeffrey Pitman, a tanner and haberdasher and Churchwarden in 1596 and 1608. He was also High Sheriff of Suffolk in 1625 and left a considerable amount of money for the repair and maintenance of the church. His monument also contains figures of his two wives and his two lawyer sons. 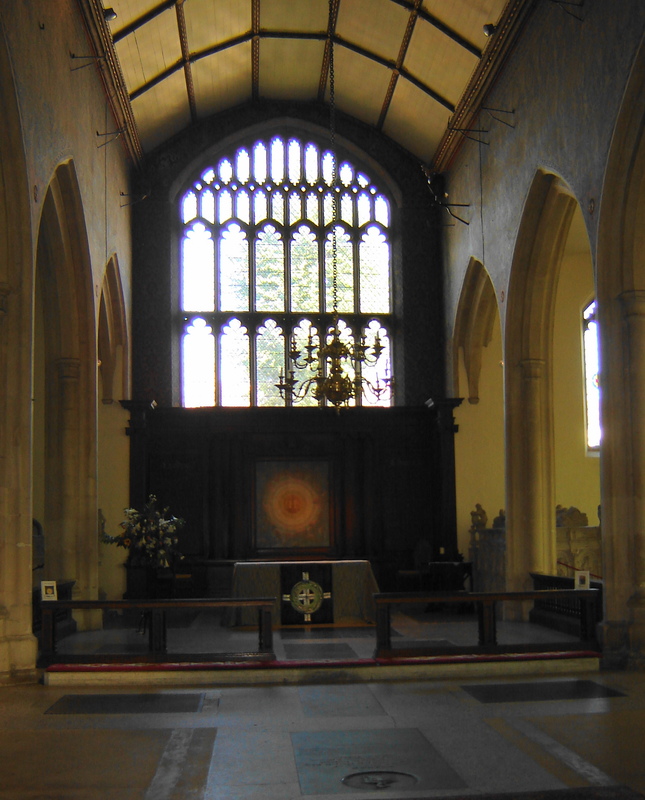 In St. Michael’s Church, Framlingham, besides the magnificent tombs of the Dukes of Norfolk, there is the tomb of Henry VIII’s illegitimate son, Henry FitzRoy, which was given into the keeping of the Duke of Norfolk by his father (see above right).